Let's start by evaluating the Buyer's Journey that your prospects go through, and how that should direct your content. If you haven't heard of the buyer's journey yet, <start sarcasm>brace yourself, this is earth shattering... </end sarcasm> The buyer's journey is a fancy name for the process every buyer goes through from the moment they realize they have a problem or opportunity, to the moment they find a solution to the problem or way to execute on the opportunity. This process is broken down into Awareness, Consideration, and Decision stages. Think of awareness as the moment I referred to above where a prospect realizes they have a problem/challenge or opportunity, and they decide to start researching a solution. Your prospects' goal here is to wrap their heads around the problem. They need to get a better grasp on what it entails and start to figure out what they need. Think of consideration as the time frame when a prospect understands what their problem/challenge/opportunity is, and knows there are multiple options for solving it. They will start collecting all of the options they have for solving their problem and begin comparing them. Your prospects' goal here is to make a short list of options that are the best fit for them. This is usually the longest part of the buyer journey. Think of decision as the 'down to details' time frame. In this stage, your prospect has 2-3 options they are comparing. They're getting ready to sign a purchase order for someone. Your prospects' goal here is to make the best final purchase decision for them. If these stages are foreign to you, replace them with top of the funnel (TOFU), middle of the funnel (MOFU), and bottom of the funnel (BOFU). They overlap nicely and in my opinion are interchangeable. Motivations and drivers are the same. Since I think understanding this stuff is easier with an example, let's take a look at the following hypothetical business (your's) and ideal buyer (your best buyer). Your Ideal Buyer Profile: Solar energy companies that sell large solar panels and install them in residential and commercial settings. The company has at least 50 employees with revenues greater than $25 million/year. The actual buyer (buyer persona) is ideally an engineer. You prefer to reach companies on the East coast for freight considerations. With an understanding of who you're targeting, and what motivates them to start their buyer journey, you can go a step further and determine what will help them at each stage. This will help you, earn them as a customer. By planning content for each stage, you can also pre-plan (strategy much??) conversion paths. You should be looking to reach TOFU prospects, and move them through the MOFU, and BOFU until they are paying customers. Using our hypothetical business and buyer from above, let's make some assumptions on what your solar engineer needs at each stage of their buyer journey, and see how you can help. Awareness - Starting to Fill the Knowledge Gaps for their problem. To reach your engineer prospect in this early awareness (TOFU) stage of their buyer journey, we should develop content that is purely educational, with no promotion of ourselves. What will be most helpful for this engineer at this point? the best metal components for the environment that the new product will be in. 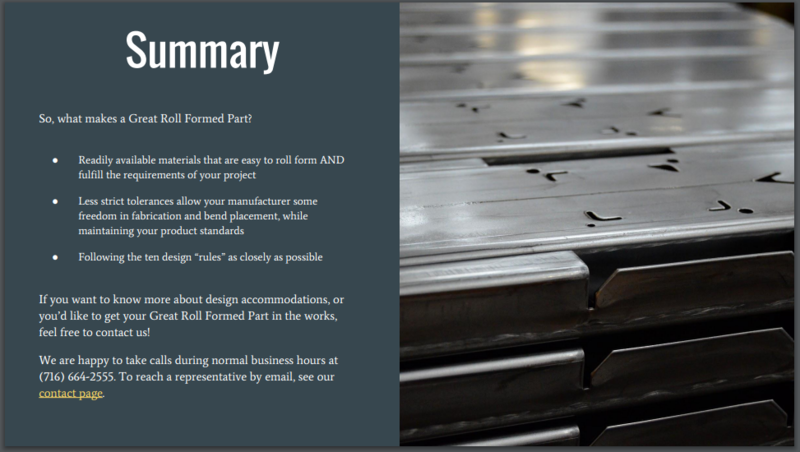 This prospect may not be ready to consider what type of part they need, but they may be curious about roll formed parts. 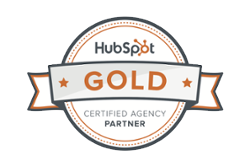 This CTA will ideally move them along, into the consideration stage of their buyer journey. Consideration - What Process Will Work Best to Make the Part They Need? When your engineer prospect has decided on the type of metal to use, stainless steel, and understands what structure they need made, they may now be in their consideration stage (MOFU). what's the best manufacturing process to turn that stainless steel into the part they need? is best for their needs. They are researching each of the options to determine what will best suit them. This is their consideration stage. In this stage, your engineer prospect would certainly find value in the CTA shown above, directing them to a guide on designing a great roll formed part. 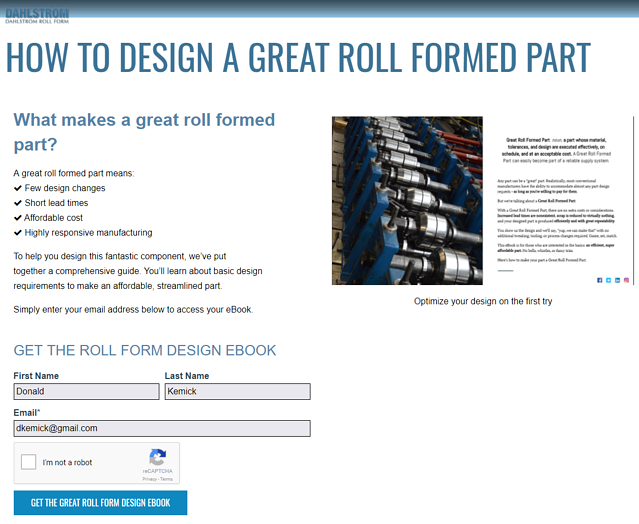 This landing page highlights the benefit to your engineer prospect, if they download the ebook. It promises an educational resource that will help them save time and money. Almost everyone would like that! To get the ebook, the prospect needs to give their name and email address. The form doesn't ask for a phone number. This important. Most prospects don't want to talk to your sales team in the consideration stage. They're still considering their options! Decision - Who'll be the BEST Provider for them? 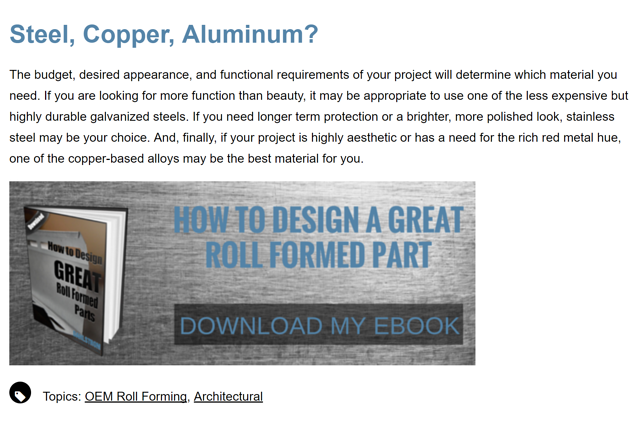 After reading your eBook and doing some additional research online, your engineer prospect decides that roll forming is the route they want to go. Now, they have a decision to make. Who will be the best provider for their 'unique' circumstances? Who will they enjoy working with? Who will meet their time frame, budget, and quality requirements? At this point, they are pitting you against your competitors in the roll forming space. They will be devouring your normal website pages, looking for insights into who you are as a company. Can they trust you? Are their any testimonials that will support your claims? Notice, they didn't spend much, if any time on your normal website pages until their decision stage. If you didn't see the value in a blog before, it should be extremely clear now. Most prospects couldn't care less about you until they are closer to a buying decision. 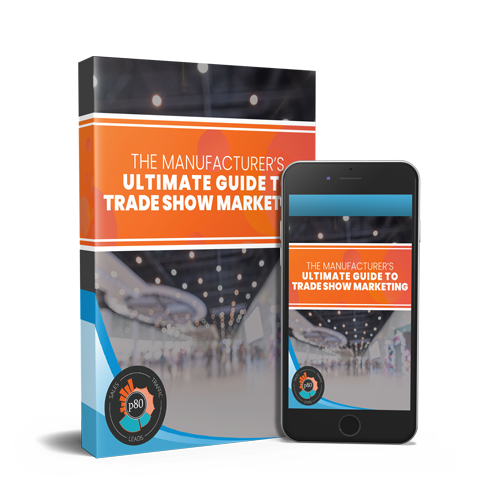 You need to be there earlier in their buying process to win new business in this day and age. BONUS - They Feel Like They Already Know Us. By the time your engineer prospect requests a quote, you've already engaged with them for a period of time. 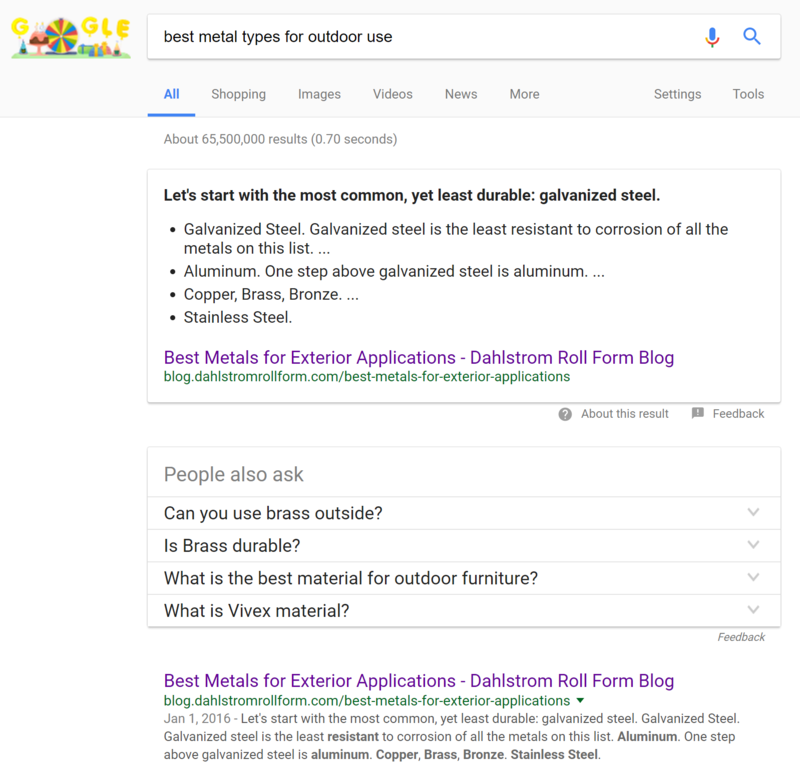 First, you helped them decide which metal to use by showing up in Google when they searched. Second, you made determining which process would be best for making their part very easy. Third, you put them at ease about whether you could fulfill their needs, by sharing testimonials and experience on your normal website pages. You did all of this without ever talking to them, and they appreciate that! Best of all, it can happen 24/7. Lead Nurturing - Between the Stages. Obviously, it's not always that straight of a line from Awareness to Decision! Each stage may last for months. They may re-start a stage multiple times. For these instances, you need to have more content that answers their other questions. When a prospect becomes a lead (They provide contact info), you should try to help them further by sharing additional educational content. You can use marketing automation to send this lead a series of follow-up emails. You can ask directly if they have any questions about what they downloaded. 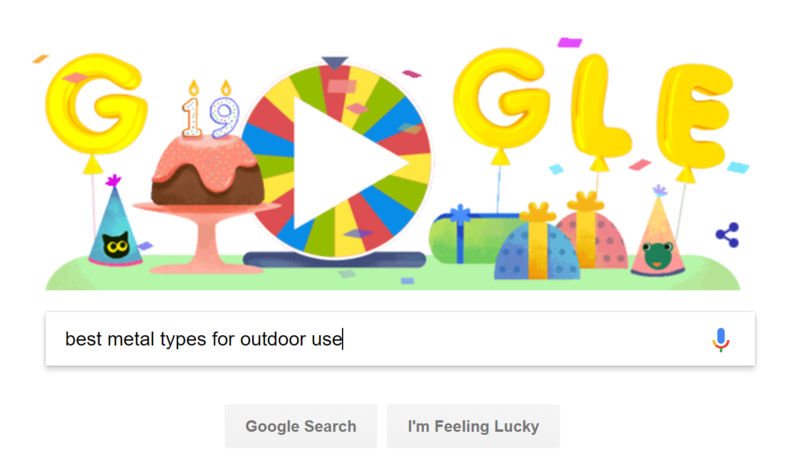 You can recommend a similar eBook or content offer that would help them. Ultimately, you're hoping to move them to the next stage of their journey, by being helpful. They may jump right to their decision stage and become a customer. You can see from the example above that understanding your ideal buyer, and the buyer's journey they go through, can put your manufacturing business in the right place, at the right time. 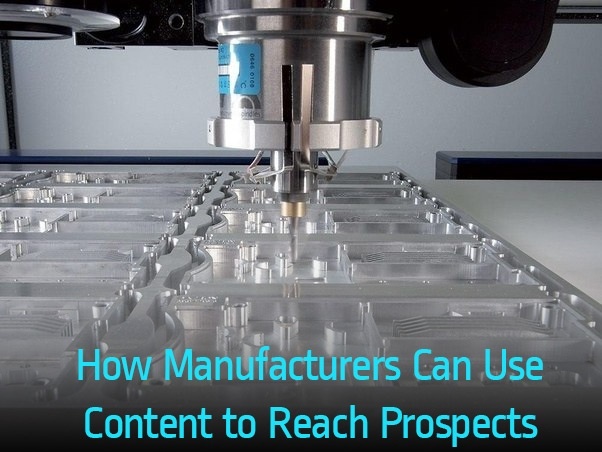 Today's modern manufacturing buyer doesn't wait for a cold call, trade show, or magazine ad. They are more proactive than that. Creating high quality content that truly helps your prospect is the key to modern lead generation.